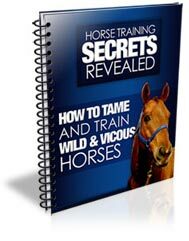 Discover how to properly tame and train any horse easily regardless of how wild or unbroken of a horse he or she is! The longer you wait the harder it is to train your horse. Experts agree, that training is easiest when the bonding and trust between owner and horse begins sooner. Trained horses are more relaxed and confident. Trained horses rarely run into situations where they are frightened and rear. Trained horses want to be ridden and do work. If your horse is trained properly, not only will they allow you to ride them, they will enjoy being ridden as well. Horses are fairly intelligent and are ranked the seventh smartest animal in the world (dogs are ranked number four). Even though horses are smart, they can be difficult to train because they are prey animals, which means in nature they are preyed upon by other animals. Because horses are prey animals, they have a very strong fight or flight instinct which can make it easy for them to get spooked and lose their train of thought or for them to become disobedient against your commands. Common Routines - This is where your horse perfects skills and activities by frequent repetitions from the trainer until it eventually becomes a habit for the horse. An example would be putting a saddle on your horse; initially your horse would be scared but once it becomes a habit the horse will expect the saddle. Desensitizing Your Horse - This is where you gradually introduce your horse to its fears so he/she can overcome them. Some examples of common horse fears would be flapping objects, barking dogs, large vehicles, etc. Positive & Negative Reinforcement - This is where you reward your horse for obeying you and make your horse aware of any actions he/she did incorrectly. It's not uncommon for people to think that their horses are deliberately disobeying them. Some people will swear that their horse knows what the owner wants them to do, but still refuse. Many people think that horses reason and think the same way as people. Unfortunately, nothing could be further from the truth. Remember, horses are prey animals and their minds are set up completely differently from people's minds. Because of this, its the trainers responsibility to use methods the horse will understand so the horse will make progress. If you don't understand that horses think differently, you will have a long battle gaining your horse's trust. Even something as simple as yelling at your horse can be detrimental in the training process. For example, if your horse started trotting away and you started yelling at your horse to get back here, you would be thinking "now that the horse knows I'm being serious by yelling, he will run back to me". Unfortunately, the horse will be thinking "That creature is growling at me loudly, there is no way I'm going anywhere near him today". Start training your horse as soon as possible - It's important for your horse to trust you and by building a positive relationship immediately after you meet the horse this will become possible. Teach the horse to see you as the leader - Horses are social animals and will look for a leader to follow. By making sure you are their leader, you will have an easier time getting them to obey you and trust you. This is just a brief introduction to training horses. 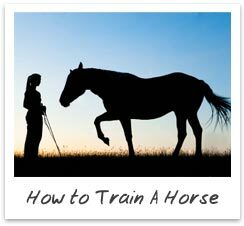 For more information on training a horse, we have included everything you need to know into an easy to follow downloadable guide. You can get the guide through the download button at the bottom of the page.